For the first time since our founding in 1998, seventy Corps Members from across our four sites started their year with a five day retreat at Eden Village Camp in Putnam, New York. During the gathering, Corps Members participated in extensive learning and community building; studied Avodah’s mission and values; engaged in intensive anti-oppression training; and heard from major leaders in the Jewish social justice space. 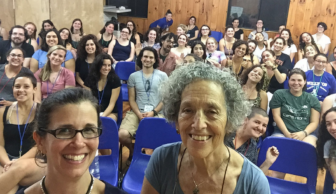 Avodah’s Executive Director Cheryl Cook with Ruth Messinger and a crowd of Corps Members. -Corps Members spent time with veteran leaders Yavilah McCoy and Ruth Messinger and heard about their personal stories, professional successes and challenges, and the current landscape of the Jewish community and the Jewish social justice movement. 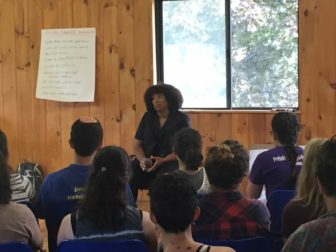 -Former staff members Suzanne Feinspan and Raven Stubbs led the Corps Members in a full-day training that covered foundational learning on systems of oppression and the role of allyship, while exploring the dynamics of anti-Jewish oppression. -An innovative “Shabbat Journey” allowed Corps Members to choose from a wide range of spiritual, religious, and reflective practices with the goal of taking an opportunity to choose options that reflected both points of connection and areas of discomfort. In keeping with the beautiful camp setting, the retreat wound down with a beautiful Havdalah service led by Corps Members, followed by a campfire filled with song, story, and laughter. 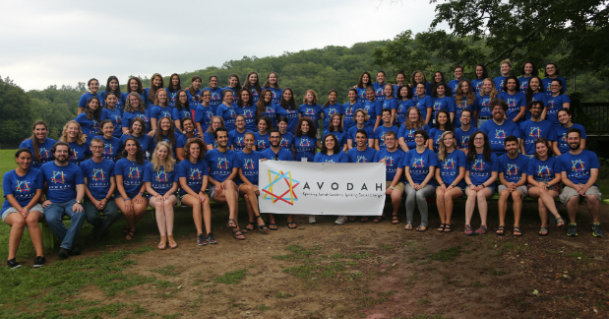 The gathering was the perfect way to launch this year of deep work, service, and learning, and our Corps Members shared that they felt more connected to Avodah and our mission from day one. Yavilah McCoy sharing her story with Corps Members. This entry was posted in Corps members, In the News. Bookmark the permalink.